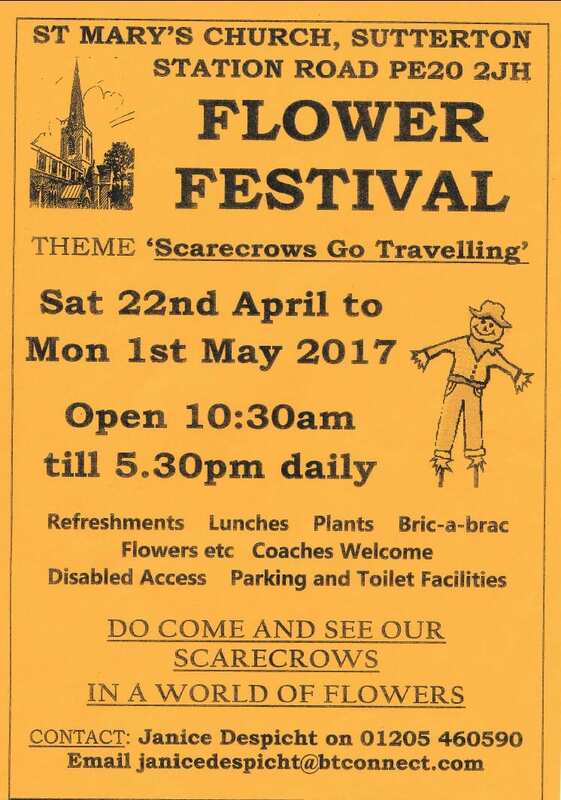 We will be holding our yearly Flower Festival for 2017 at St Mary’s Church in Sutterton. It’s held from Saturday 22nd April to Monday 1st May, 2017. It opens at 10:30 through to 5.30pm each day. Coaches are welcome, plus there is good disabled access along with parking and toilet facilities. This year’s theme is “Scarecrows Go Travelling”. For more information, please contact Janice on 01205 460590, or email janicedespicht@btconnect.com. Poster of the event is shown below. Tell your friends and family.